Far Eastern Press, 9780967884219, 434pp. Flight of the Goose is an award-winning novel about an indigenous woman shaman, a draft-dodging bird scientist, and a young Inupiaq hunter caught between traditions. "The story took my breath away. I wept my way through it, identifying profoundly with both protagonists. (Thomas) has a fine grasp of the complexity of human relations and culture in such a village. She also writes beautifully. A remarkable book altogether." "Memorable...One of the best novels of Alaska that I have read. With the author's unerring knowledge of anthropology and social and environmental issues, it could fit any rural Alaskan village." So relates Kayuqtuq Ugungoraseok, "the red fox." An orphan traumatized by her past, she seeks respect in her traditional Inupiat village through the outlawed path of shamanism. Her plan leads to tragedy when she interferes with scientist Leif Trygvesen, who has come to research the effects of oil spills on salt marshes - and evade the draft. Told from both Kayuqtuq's and Leif's perspectives, Flight of the Gooseis a tale of cultural conflict, spiritual awakening, redemption and love in a time when things were - to use the phrase of an old arctic shaman - "no longer familiar." Flight of the Goose is recommended in Cultural Survival Quarterly, Shaman's Drum Journal, First Alaskans Magazine, Tundra Drums, Seattle Post Intelligencer and Sacred Hoop Magazine. Flight of the Goose won first place in several literary contests. See more at www.flightofthegoose.strikingly.com. 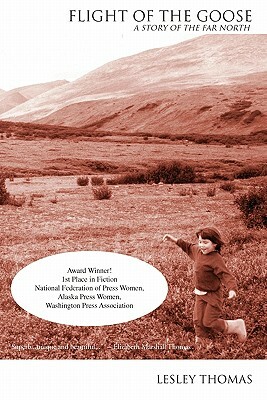 Lesley Thomas grew up in rural communities in the Alaskan Arctic. She also was raised on on a fishing boat in Southeast Alaska and on a small farm in the Pacific Northwest. Her families of birth and of intermarriage branch from cultures all over the Earth and include hunters and gatherers, scientists and healers. Her interest in shamanism, storytelling and birds began early. To write Flight of the Goose, she also used her background in ecology and field research on the effects of oil spills on arctic salt marsh. Thomas has taught at colleges and published poetry, fiction and nonfiction. Although she now lives in Seattle, she returns often to the Far North to visit her ever-growing family and the beautiful land.